This year, I hung an Advent calendar that has 25 different envelopes that I hand-embroidered. In each envelope, there’s a slip of paper with an activity that we can do together. 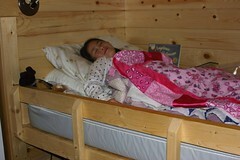 For the first day, I had the girls make a fort house with blankets and I read to them in the fort. I think they found every blanket in the house to create the fort. 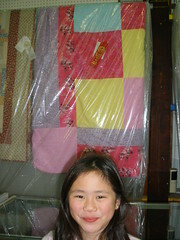 They used rubber bands and safety pins to fasten the blankets-to-blankets as well as blankets-to-chairs. 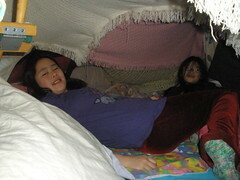 The fort had even more blankets in it along with pillows. The girls each picked a Christmas book they wanted me to read in the fort. A couple of the cats even joined us to listen to the stories. 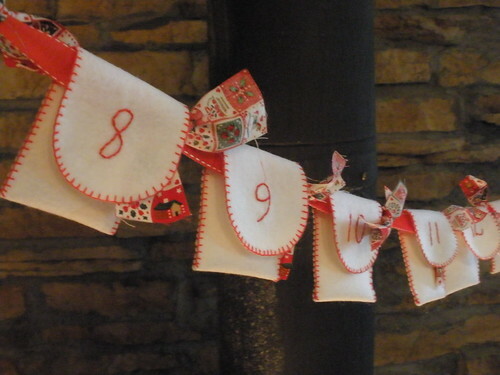 Part of the Advent calendar that I made. Each envelope is hand-embroidered. The pockets close with a circle of velcro. 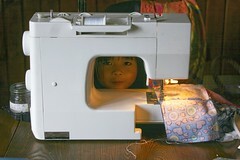 I made this for the SEWvenire Quilt Block swap on Swap-Bot. The goal was to create a quilt block that represented one’s state. 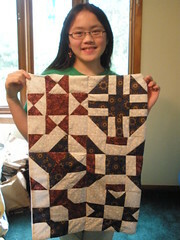 By participating in the monthly swap, ultimately each participant will have enough blocks to make a quilt made from SEWvenire blocks sent to her from different states, maybe even different countries. 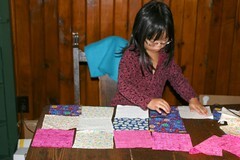 I’m combining the blocks that are sent to me with ones that I make (a copy of the quilt block I sent to someone else). 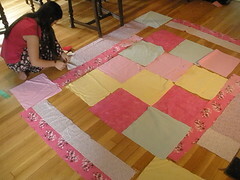 So, eventually the quilt front will include half the blocks made by others and half by me. The items written in fabric paint were required elements of the swap. This quilt block is 12 1/2″ square. The 9 different fabric pieces were ironed to the background fabric using iron-on adhesive. 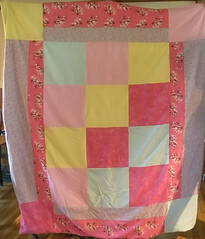 I then did free-motion quilting to secure the pieces to the quilt. 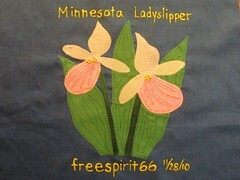 Once it was done, I added the written words and the yellow centers to the ladyslipper flowers with fabric paint. For the quilt block that I will be making for myself, I’m going to embroider the words since the background fabric I’m going to be using is lighter and I can trace some nice lettering. 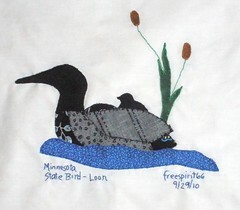 Last month for the SEWvenire quilt block, I chose Minnesota’s state bird (the loon). This month, it is the ladyslipper (Cypripedium reginae). Also known as the showy lady’s slipper or queen’s lady slipper, it was adopted as the state flower in 1902. Found living in open fens, bogs, swamps, and damp woods where there is plenty of light, these flowers grow slowly, taking up to 16 years to produce their first flowers. They bloom in late June or early July. The plants live for up to 50 years and grow four feet tall. A century ago, the flowers were a favorite adornment in rural church altars during the summer. Since 1925 this rare wildflower has been protected by state law (it is illegal to pick the flowers or to uproot or unearth the plants). The flowers are difficult to find. Apparently there are some that can be found on the bog at Beckman Lake in Isanti County. May be worth the trip some summer to see what they look….particularly if there are ones that are 4 feet tall! This is a set of Waldorf-inspired math gnomes that I made for a customer for my shop, Harvest Moon by Hand. 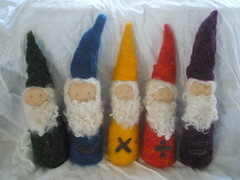 The gnomes stand between 9-10” inches tall, and each is needlefelted by hand. Sometimes I use 4 barbed needles at a time and at other times only a single barbed needle (for example, when attaching the curly sheep wool to the face and body or creating the math symbols on the bodies). Each gnome has a different math sign on the body – addition, subtraction, multiplication, division, and equals. Individual gnomes and combination of gnomes can be used in combination with natural tactile elements (e.g., pebbles, gems, acorns) to make learning math more tangible. There are many Waldorf-inspired stories using math gnomes on the internet. 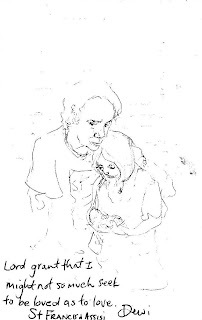 You may choose to use one of the stories as they are presented…or create your own stories. The gnomes are made from sheep wool – the interior core is from cream-colored wool from sheep that I raised at Harvest Moon’s organic farm. 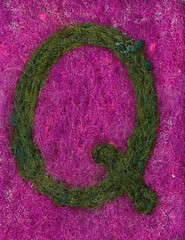 The exterior (colored) wool is from a variety of textile artists who hand-dye sheep wool. For a set of custom-made gnomes or other needlefelted items, please visit my shop, Harvest Moon by Hand. For many years I’ve been interested in the life of St. Francis. His relationship with nature and animals as well as his views on simplicity and frugality are of particular interest. During the past couple of years, I’ve participated in different swaps on Swap-Bot, and have been introduced to mail art. 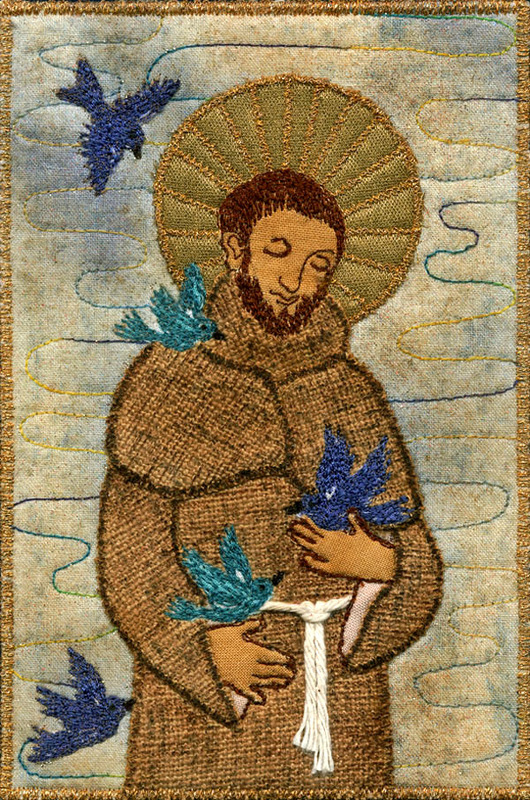 So, I started another website dedicated to The St. Francis Mail Art Project which is a on-going internet gallery of mail art that is received that positively depicts St. Francis, his life, his writing, and how individuals are living a life that is inspired by St. Francis. 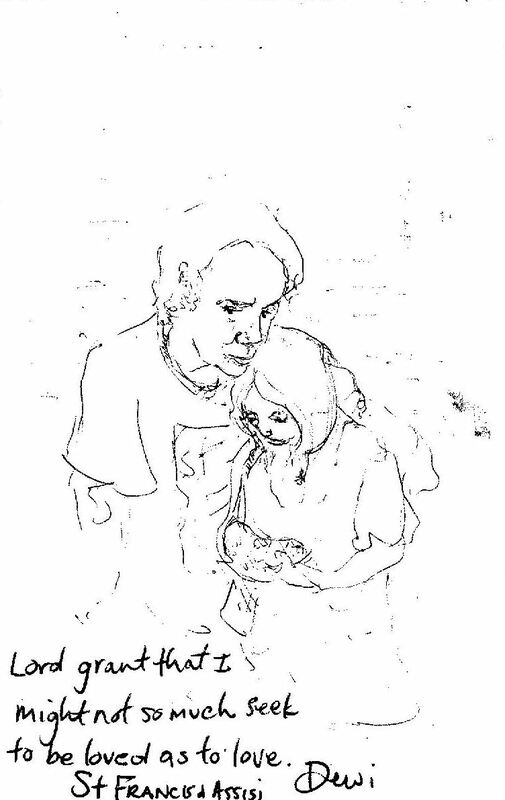 The project is open to any type of print media of any size (no video or audio, please), and each artist’s interpretation. Postcards, photographs, textiles, sculpture, mail art, artistamps, calligraphy…so many options. 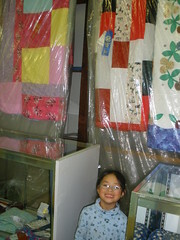 For more information and/or to send an item in to be included in the gallery, please visit HERE. I made this for a swap on Swap-Bot – called SEWvenir Quilt Block (round 1). 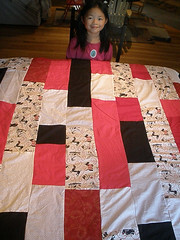 Am also going to make a version for a personal quilt as well. The swap is going to be a series in which a person can collect SEWvenirs from other places without the expense of going there. 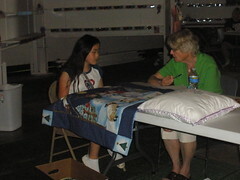 Each quilt block that I will receive will be from a different state or country. What I’d like to do is make a quilt that has the quilt blocks from the other places as well as a copy of the one that I sent to other people. This block is 12 1/2″ x 12 1/2″ (12″ block size with 1/2″ seam allowance). 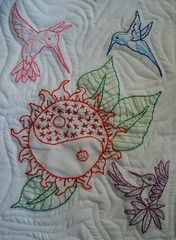 There are a variety of different cotton fabrics that I hand-embroidered together onto the white cotton backing. 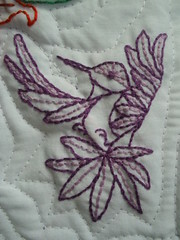 The embroidery stitches used were the back stitch and blanket stitch.